Braised short ribs are a decadent and delicious alternative to brisket for Passover, or anytime you want to serve up a very special meal. They are so tender from cooking low and slow, they literally fall off the bone. Adding dried fruit to meaty dishes is one of my favorite tricks for creating a sweet and savory flavor profile. Plus the acidity from the red wine and balsamic vinegar adds an extra special touch of umami. The trick to a tender and flavorful dish for many kinds of braised meat dishes is creating layers of flavor, which begins by browning the short ribs in a large pan first to lock in the juices and caramelize the meat. Then I add a mix of chopped aromatic vegetables (onions, carrots, and celery) to cook in the fat rendered by the meat, getting all those “good bits” off the bottom of the pan. After the vegetables have softened, it’s time to add the liquids — in this case, sweet wine, stock, and balsamic vinegar — and then cook it all low and slow until the meat is crazy tender. 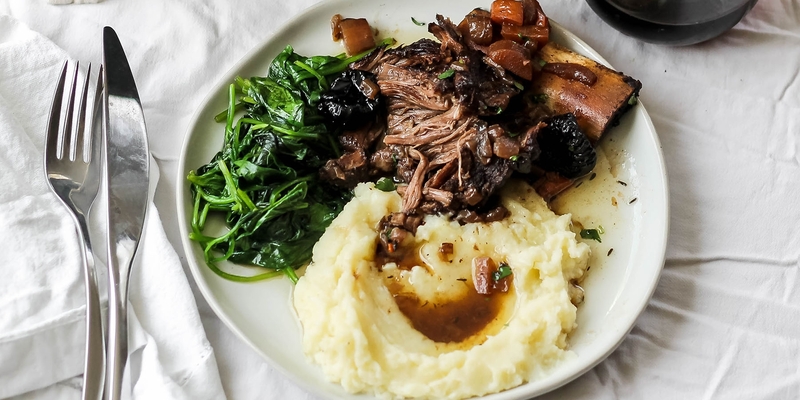 I love to serve these short ribs with mashed or roasted potatoes, roasted vegetables, and wilted greens. But be warned — they always get devoured quickly. Remove the short ribs from the fridge and rub well with black pepper and fresh thyme leaves. Let the short ribs sit out for about an hour while they come to room temperature. In a large sauté pan, heat the olive oil over medium/high heat, then brown the short ribs over high heat on each side. Work in batches and don’t crowd the pan, to ensure that each piece gets good caramelization. Place the browned short ribs in a heavy bottom Dutch oven, set aside. Preheat the oven to 325 degrees F. Add the onions, carrots, and celery to the skillet where you browned the short ribs, and cook over medium heat for about 7-8 minutes until the vegetables soften and start to caramelize. Add the balsamic vinegar, port, and red wine to the vegetables, then turn the heat up to high, bring the mixture to a boil, and cook until the liquids have reduced by about half. Add the beef stock and bring the mixture back up to a boil. 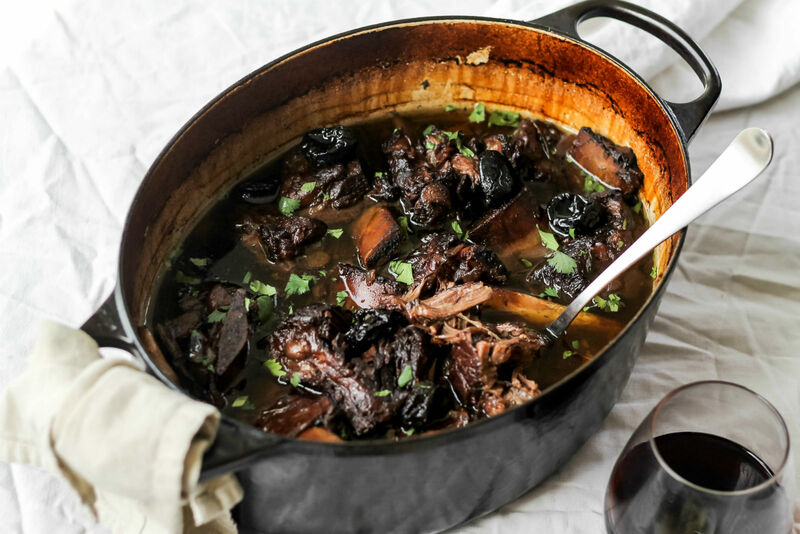 Pour the wine mixture over the short ribs and add the bay leaves and pitted prunes to the Dutch oven. Cover with a tight-fitting lid and braise the short ribs for about 3 hours in the oven. Remove the lid from the pot for the last 15 minutes of cooking to crisp up the short ribs and ensure that sauce is thickened slightly. Serve with mashed potatoes and roasted vegetables or wilted greens. Be sure to serve each portion with plenty of the pan sauces and a few prunes. A classic dish, re-imagined with sweet and savory flavors.